Imagine the feeling of having worked for 10 months planning a DX­pedition, with charter boat arranged, and half the expedition team formed, only to see it cancelled two weeks prior to announcing it to the world? This is the start of the VK9WA story! We were days away from announcing a DXpedition to a top 25 location, but were beaten to the press by another team. Needless to say, we were very disappointed after having worked so hard putting the plans in place. We gave Bernie (W3UR) a call, ask­ing for his advice on how best to pro­ceed given what had just unfolded. Bernie’s words were, in effect, “The world is a big place, with so many other locations needing to be activat­ed! Here are a few places that come to mind…”. Armed with Bernie’s words of wis­dom and encouragement, team lead­ers Rob (N7QT) and Jared (N7SMI) quickly refocused on Willis Island. It was #32 on the Club Log most want­ed entities list at the time and had not had a significant activation since 2008. Once we were confident that landing rights and call sign could be obtained, we announced to the world that we would be activating VK9/W and formed the rest of the team – Sandro (VE7NY), Adam (K7EDX), Hawk (SM5AQD), Gus (SM3SGP), Al­lan (VE7SZ), and Hal (W8HC). Provide all time new ones (ATNOs) to as many stations as possible. By focusing on fewer band slots/modes during the expedition we would in­crease the percentage of “unique” stations worked. Provide QSO percentage equity be­tween the big three – Asia, Europe, and North America, while also pro­viding opportunity to other regions, such as Oceania, Africa, and South America. 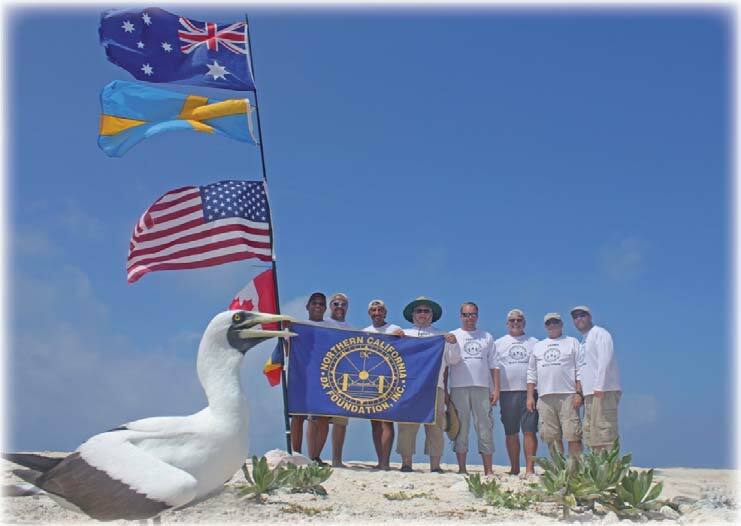 DXCC entity Willis Island is com­prised of 3 small coral islands or cays. and other animals. They are part of the Coral Sea Common­wealth Marine Reserve due to their unique physical, ecological, and heri­tage values. Access is provided only via boat under a government issued permit. The largest island, Willis Island, is home to a meteorological station that is manned by 3 weather observers. While Willis Island is the easiest to land on, we quickly learned that addi­tional permissions would be required to operate from this island, so we set our sights on Middle Cay, the small­est of the islets—only 4 acres in size and extending just 3 meters above sea level. Middle Cay had been acti­vated before and had a less difficult approach and landing than North Cay. Station equipment was staged and tested well before departure. With 8 team members, we decided to have four stations on the air. Each was designed to have nearly identical equipment and support for all modes – CW, SSB, and RTTY. This enabled any team member to operate at any station with minimal adjustments and configuration. To minimize costs, we primarily used personal equipment of individu­al team members located all over the world. Because the team would be meeting for the first time in Cairns, Australia just 2 days prior to vessel departure it was imperative that the equipment list be accurate. With lim­ited luggage allowance, duplication/ redundancy of equipment was limited to only the most critical items. Once we determined the govern­ment agency responsible for issuing landing rights, we applied for permis­sion to land and operate on Middle Cay. The permit was issued roughly 30 days later. It required that we minimize environmental impact on the island. The call sign application was straightforward, though it took roughly 4 months for the VK9WA call to be issued due to technical and bu­reaucratic delays in the Australian li­censing system. At the recommendation of our Parks Australia contact, we selected Bianca Charters (biancacharters.com) based out of Port Douglas to provide trans­portation to/from Middle Cay. Captain Peter Sayre knows the Coral Sea bet­ter than perhaps any man alive. The equipment list was continually refined up to the day we departed for Middle Cay. This was going to be the team’s first expedition to an uninhab­ited island. It was difficult to deter­mine what was going to be needed considering mostly unknown weath­er conditions, sand/soil type, island layout, etc. Based on data from the nearby weather monitoring station, we did, however, know that it was go­ing to be hot with high temperatures around 90°F (32°C) and windy at all times, with the possibility of gusts of at least 40-45 knots and a chance of significant rain. 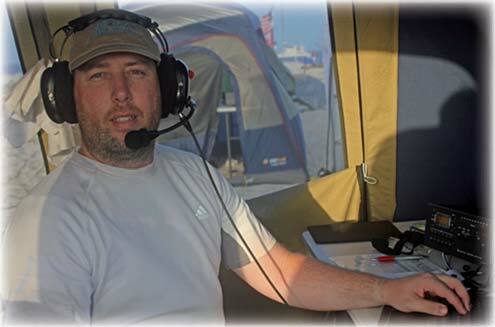 Gene (K5GS), who participated in the TX3X DXpedition to Chesterfield Island, provided help­ful recommendations on what to ex­pect. Armed with this knowledge, we selected canvas spring-bar tents re­inforced with steel supports and ply­wood tent flooring – 3 tents for op­erating and 1 “rest” tent. We took ample sandbags and plenty of metal anchors/stakes between 3 and 6 feet long. Station power was supplied by 4 Honda EU20i (220 V version of the EU2000 model) generators. The se­lection of the Honda generators was easy based on their reliability and be­ing RF quiet. We also purchased ex­ternal fuel tanks allowing extended running time and refueling without the need to shut down operations. To provide constant feedback to the community and minimize du­plicate QSOs, we chose to regularly update Club Log during the expedi­tion. This required a wireless network on the island,allowing all stations to sync to a master N1MM+ database. To limit the amount of satellite inter­net/data traffic, a $30 Raspberry Pi computer with custom-built software was used to manually initiate log up­loads every few hours via an iSatH­ub satellite phone. Michael (G7VJR) was instrumental in adding Club Log functionality to support uploading of compressed ADIF log files, further reducing our satellite data charges. In the end, the total data usage for incremental log uploads and daily e-mail communications with pilots and family members was only 15 MB at a cost of just $71! A Delorme inReach device was also taken to allow satellite text message communication with pilots and family members, and to allow them to track our location on the voyage. amperage (15 amps and higher) electrical plugs are physically different than lower amperage plugs. Paul saved us from a significant problem by pointing out that the extension cords we had originally purchased would not plug into the generators! Paul also deemed that our baseball caps would be insufficient to protect us from the sun. Locally purchased $5 sun hats proved to be a very welcome last-minute addition to our cargo. A week prior to our departure Bi­anca Charters advised us that our departure point had to be changed from Cairns to Port Douglas – a one-hour drive North of Cairns. This re­quired some quick adjustments to our original plans. The morning of departure a moving truck arrived at Paul’s home to transport our gear. The gear barely fit in the large truck. 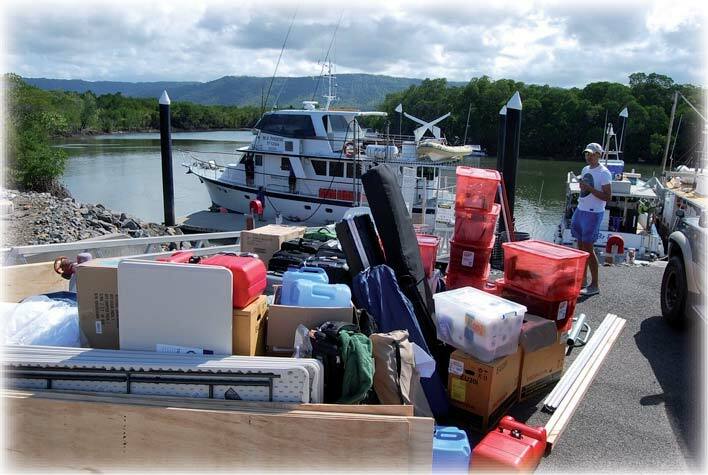 The team boarded a charter bus with a few of our remaining supplies and headed up the coast to Port Douglas. We were all ready and excited for this adven­ture to really begin, yet anxious about the un­knowns. Would all of our gear fit into the vessel? How would we fare over the 30-hour boat ride? Did we forget or overlook anything? Had we planned on enough fuel for the generators? Would everyone remain healthy and safe? The list of unknowns was ex­ tensive, yet we had confidence in our planning. The team arrived in Port Douglas around 16:00 as MV Phoenix was be­ing fueled for the trip. The Phoenix is a 65’ diesel-powered, aluminum-hulled vessel. It can accommodate up to 12 passengers, plus 4 crew. We were thrilled to find the captain and crew extremely competent and help­ful – the operation truly would not have been a success without them! After loading the Phoenix and a final supper in Port Douglas, and e-mails and calls to home, we departed for Middle Cay around 10 PM. The late departure would ensure an early morning arrival at Middle Cay. The 30-hour voyage to the Willis Islets was rough with large swells, with only a couple team members becoming seasick. Early Saturday we awoke to a sunny morning, greeted by numerous seagulls and boobies gliding in the wind along the Phoenix. We could see the silhouette of nearby Middle Cay on the horizon. Arriving at Middle Cay was exhila­rating to say the least. It’s likely that more people have been in space than have set foot on Middle Cay. We had examined a few old photos of the is­land and talked to some of the very few people to have landed there, but to actually be there brought relief af­ter months of intense planning. The Phoenix navigated the danger­ous coral reef heads surrounding the island and anchored about ¼ mile off­shore. 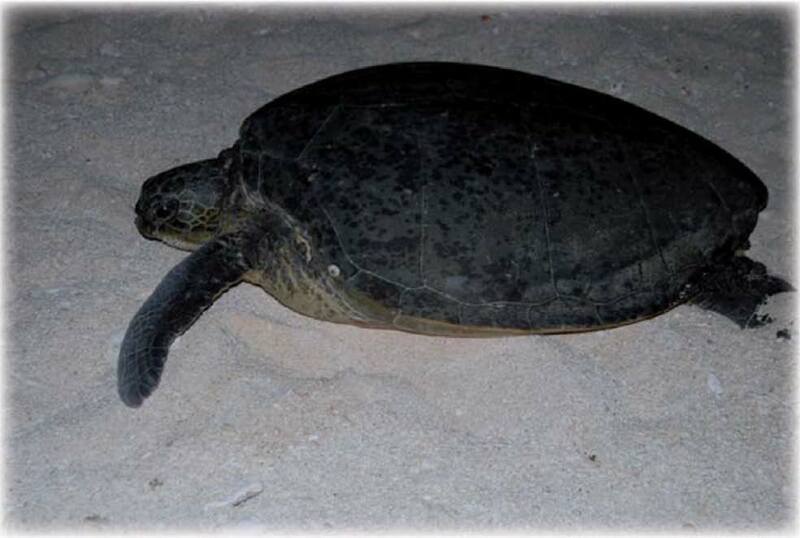 Upon landing, a position on the North shore 500 feet from the landing site, was found to be optimal – not only for propagation to the North, but the steep slope of the shore would minimize impact on nesting turtles. Making 20 trips in the small dinghy and carrying 2 tons of gear over the difficult 500-foot expanse of sand was difficult. The soft white sand added to the sun’s intensity. Despite sev­eral applications of SPF 50 sunscreen, several team members found them­selves sunburned on the first day. It took almost 10 hours to get tents, antennas, stations, and generators setup. Just before dusk on Saturday, November 14th, with all 4 stations op­erational, we were finally ready to call “CQ CQ VK9WA”. The initial pileups were large and intense – and they let up only little over the course of the next 10 days. While propagation numbers and fore­casts weren’t great, it was astonish­ing that we were hearing and being heard so well. All team members were scheduled for up to 10 hours of operating per day, with longer rest periods every few days. For the first 3 days, the en­tire team took a lunch break on the vessel from noon to 2 PM local time – when propagation was the weak­est. We used this opportunity to de­brief and refocus the team, discuss strategy (what was working and what wasn’t), coordinate band and operat­ing schedules, service and repair gen­erators and antennas, shower, as well as get some much needed rest. The vessel crew delivered breakfast and dinner to the island so the team could continue operating during the critical gray line openings. We ate very well. Our pilots provided valuable feed­back and recommendations. They apprised us of critical band openings, times in which we should focus on specific regions to maximize oppor­tunity and geographic equity between EU, Asia, and NA, and also helped us provide opportunity for SA, AF, and OC stations. The first few days were extremely long and hard given the high humid­ity, and an extremely intense sun, with the air filled with the thick smell of guano from the many thousands of sea birds whose home we had en­tered. The bird noise was constant 24 hours and so very loud. Evening temperatures of around 80 °F, com­bined with a constant SE wind, made it comfortable. However, after a few days of nice weather, conditions worsened. The wind increased to over 30 knots and it rained intermittently. Due to the very strong surf, it became too danger­ous to land the dinghy on the island. For nearly 4 days the team remained on the island without showers or our planned overnight rest periods on the vessel. One of the Phoenix crew members would swim from 50 yards off-shore towing coolers full of hot meals and fresh water twice daily. Despite uncomfortable conditions on the island, the team remained in good spirits and increased our operating time and efforts. The high winds and the blowing salt water mist were very problematic during this time of poor weather. Salt water found its way onto and into ev­erything. This required some adjust­ments and repairs to antennas and tents. Significant and fast-spreading corrosion affected everything that could corrode. Our brand new genera­tors which ran in an enclosed wooden structure suffered a large amount of internal corrosion after only 10 days of operating. Upon our return, a ma­jority of our radios and antennas had to be serviced, cleaned, and then treated with DeOxit due to corrosion. For the last 2 days of the DXpedi­tion, the weather significantly im­proved. At 19:00 UTC on November 23, 2015, VK9WA went QRT with 61,738 QSOs in the log. It took many hours to disassemble and transport our gear and equipment back to the vessel. Then we were on our way back to Port Douglas and our homes around the world. We truly cherished our time on lit­tle Middle Cay. The thousands of sea birds, spectacular sunrises and sun­sets, walks around the island (it only took 10 minutes), millions of crabs, and gigantic sea turtles provided life­time memories. Despite long days and difficult conditions, the VK9WA team got along spectacularly and we all had an incredibly fun time. We invite all to check out the drone footage video of our camp and beau­tiful Middle Cay at VK9WA.com. Martti Laine (OH2BH) and Wayne Mills (N7NG) had provided the VK­9WA team a preliminary version of their paper The DX Chase: It Takes Two to Tango. This paper and their recommendations helped us strat­egize operating procedures to mini­mize QRM and frustration in the pile­ups. We thank Martti and Wayne for their advice, and we recommend that all DXers read their paper. We had only minimal problems with deliberate QRM, stations calling out of turn, or stations in one region preventing us from working other re­gions. We would like to commend the overall amateur radio community for working together to make this hap­pen. Thank you! Special commendations are due to the Japanese radio operators for standing by – often for very long pe­riods – while we worked openings into other parts of the world. We could work Japan at almost any time of the day. The VK9WA team expresses our appreciation to JA DXers for be­ing extremely considerate and patient! Many operators in the SSB pileups had significantly too high microphone gain and/or compression levels. Many pileup stations were unintelligible and made it difficult to work others in the vicinity of their TX frequency. We stress the importance of listening to your on-air audio. it – give only a sig­nal report in reply. With the prevalence of panadapters and skimmer software, we found that numerous stations would call at the exact same location as the last sta­tion logged. Because of this, we rarely would work more than one or two sta­tions before moving our RX location. Unless you have a very loud station, moving just above or below the last station will likely get you in the log faster. All team members operated in fairly regular patterns. Listening and then strategizing your location in the pileup is much more effective than calling blindly or jumping on the fre­quency of the last station logged. While operating RTTY, we would fre-quently find stations tail-ending or transmitting on top of the station we were trying to work, thereby prevent­ing the called station from completing his or her exchange. Overall we had very little to com­plain about, so thank you all. Band selection was fairly straight­forward by simply following the sun’s gray line. At sunrise, we would place several stations on the upper bands and primarily call for NA/SA. As the morning progressed we would see the NA stations falling off from East to West, then would call Asia/Oceania through the afternoon, at which point Asiatic Russia, India, and China sta­tions and then Europe would start to come through as daylight progressed West across the globe. We found that the upper bands would often stay open well past our sunset allowing us to work Europe even though we were in complete darkness. At dusk we would leave one or two of the stations working Europeans on the upper bands, and move the re­maining stations to the lower bands and work NA/SA to AS/OC to EU/AF throughout the night. This cycle was generally repeated for the duration of our expedition, allowing amateur radio operators around the world the ability to know when and where to expect we would be calling into their region. We were all surprised that 20 me­ters was completely dead at our sunrise for several hours. This was counter to our experience with and expectations for 20 meters. Because of the incredible high band openings, we had great success on these bands. 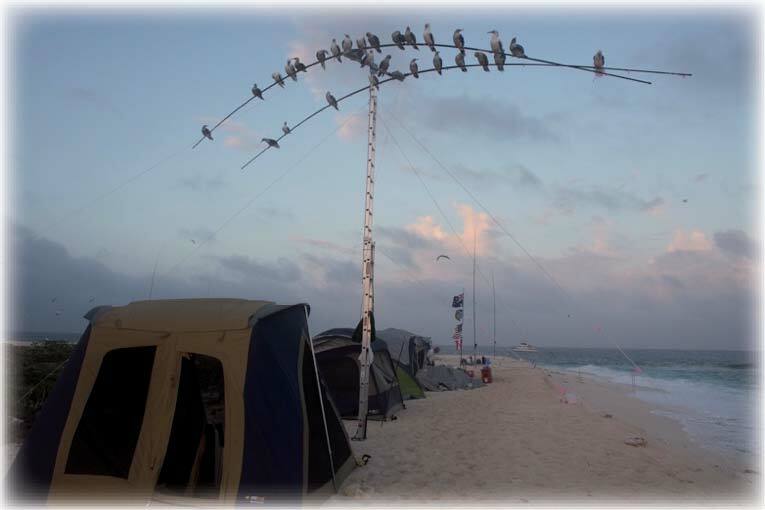 12 meters was our most successful band with 11405 QSOs. A primary goal was to minimize DXpedition costs. Excluding airfare and hotel costs (each team member fully paid for their own transportation to/from and hotel in Australia) and post-operation QSL costs, our total expenses were less than $1 per QSO! This is nearly unheard of for a DXpedition of this scope and size to an uninhabited island. With the char­ter vessel comprising 70 % of our to­tal expense, we’re thrilled to have put on a highly successful DXpedition at minimal cost. We express special appreciation to our sponsors and the many who have donated to support the VK9WA operation. We are especially grateful to the Northern California DX Foun­dation, INDEXA, and the German DX Foundation for their primary sponsor­ships. Other sponsors were SteppIR, Elecraft, The UK DX Foundation, West Virginia DX Association, SouthWest Ohio DX Association, Mississippi DX/ Contest Club, Swiss DX Foundation, DXNews.com, Bridgerland Amateur Radio Club, Western Washington DX Club, Utah DX Association, HB9ON Radio Club, LA DX Group, European DX Foundation, RadioSport, South­eastern DX Club, Array Solutions, Mediterraneo DX Club, Orca DX and Contest Club, Lone Star DX Asso­ciation, The Carolina DX Association, Clipperton DX Club, GMDX Group, Telepost Inc., Expert Linears America, DX Engineering, KF7P Metalwerks, The RF Connection, North Alabama DX Club, Danish DX Group, Willa­mette Valley DX Club, Spokane DX Association, DX University, Madison DX Club, Arkansas DX Association, RF Solutions, Mile-Hi DX Association, and Club Log. We’d like to thank our pilots Mike (K4PI), Cedric (F5UKW), and Andre (V51B) for the amazing service they provided during the expedition. We would also like to extend a heartfelt thank you to Paul Newman (VK4APN) for his hospitality and guidance, be­fore and after the VK9WA expedition. 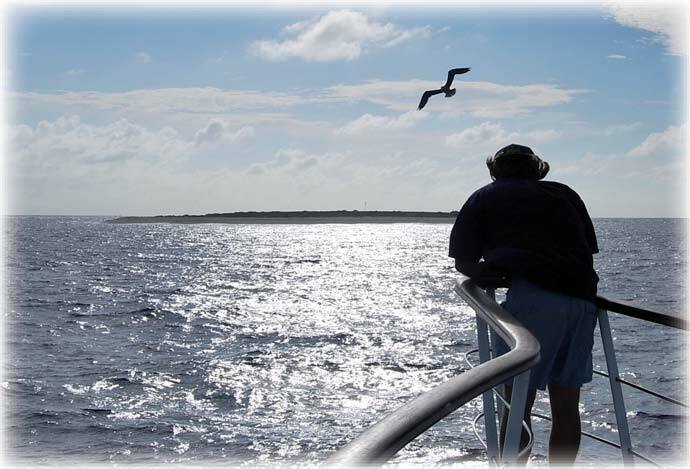 We were elated by the service pro­vided by our crew and Captain Peter Sayre of Bianca Charters. They all were an absolute pleasure to work with and we look forward to working with them again in the future. 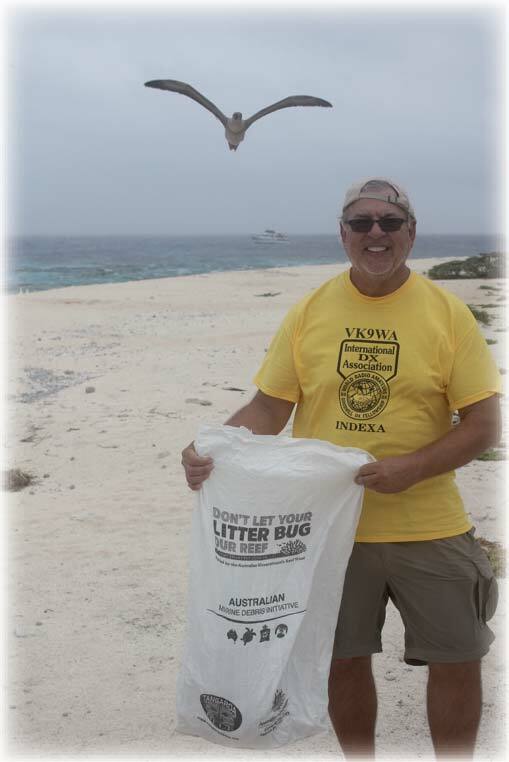 We thank all who have donated and supported the VK9WA DXpedition, and everyone that contacted us. We look forward to working you all on a future expedition.